This is the scene creator not just for upcoming Valentine’s Day to help you create unlimited variations of header / hero images / landing pages. Contains 64 items + 12 pre-set background colours. Every item was photographed and isolated. Shadows are on separate layers. Save time and use these assets and mock-ups instead of taking pictures. It’s very easy to use. 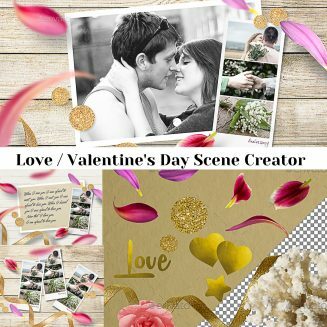 Tags: advertising, anniversary, asset, card, collection, creator, creator scene, feminine, flower, flowers, generator, greeting, heart, holiday, isolated, love, mockup, mockup scene, photo, pink, postcard, present, presentation, realistic, romantic, rose, scene, screen, St.Valentine's day, Valentine's Day, wedding.